Instagram, owned by Facebook, is a photo and video-sharing social networking service which allows users to upload photos and videos, editing with various filters, and organized with tags and location information. It gained popularity rapidly after its launch in 2010, with one million registered users in two months, 10 million in a year, and more than 1 billion monthly active users by now. Instagram Stories is a feature that Instagram launched in August 2016 which lets users post photos and videos that vanish after 24 hours, similar to Snapchat. And to make the post more interesting, a lot of users are wondering whether they can add music to Instagram Stories. Thanks to Instagram Story Music Sticker, a new feature that Instagram released in June 2018, users in a number of countries, including the US, the UK, Australia, France, Germany, New Zealand and Sweden, are able to add music to Instagram post now. Step 1Download the latest version of the Instagram app on iOS or Android. Go to Instagram Stories, take a photo or video, and then tap the “Stickers” button at the top of the screen. You’ll see the new music option appear alongside your other sticker options. Step 2Tap the music sticker icon to open the Instagram music library, where you’ll find thousands of songs to choose from. You can either search for a specific song, browse by mood, genre or what’s popular. And you can tap the play button to hear a preview before adding it to your story too. Step 3Choose the exact part of the music that fits your story. Now you’re ready to post to Instagram Stories as usual — add GIFs, polls, hashtags or anything else you might like to add, tap the “Your Story” button at the bottom of your screen, and you’re all set! Instagram Stories Music Sticker is indeed a useful function to be used, though the choice for music selection is limited and the service is unavailable in some countries. And in the next part, we are going to show you a more powerful way, which may meet all your need. Spotify is the King in the music streaming world, which is well-known for vast music library. It would be perfect if we are able to add songs from Spotify to Instagram Stories. In this part, we are going to show you how to download songs from Spotify with high audio quality to your computer and then integrate the music to your Instagram Stories step by step. As all the songs on Spotify are in an encoded format, to get songs download from Spotify, we’ll have to turn to a music tool. Here we recommend the most popular Spotify downloader – TunePat Spotify Converter. TunePat Spotify Converter is a professional music tool specially designed for helping Spotify users to enjoy Spotify songs more freely. With no need to install the Spotify app, it is able to save songs, albums and playlists from Spotify as MP3, AAC, WAV and FLAC files at 10X fast conversion speed with lossless output audio quality while keeping the ID3 tags. 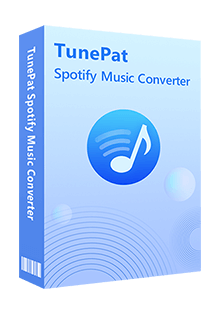 TunePat Spotify Converter is available for both Windows and Mac versions. Here we take the Windows version as an example. If you are a Mac user, please refer to How to Get Spotify Songs Download to Mac for more details. Launch TunePat Spotify Converter. Click the "Settings" button on the bottom right corner. Here you can choose output format (MP3/AAC/WAV/FLAC), output audio quality, customize output path, organize the output files in various ways and more. Click "Convert" button and soon TunePat is on the way to export your Spotify songs to your local computer. Once the conversion is done, you can find your downloaded Spotify songs by clicking the "History" button on the bottom right corner or directly going to the output folder you customized in previous step. Now that you've got the target song from Spotify to your computer, you can easily transfer it to your Andorid phone or iPhone. Open your video through InShot Video Editor, tap on the Music icon at the toolbar, select the target song, click on Save and upload the saved video as a story to your Instagram. All done! Video Tutorial: How to Download Music from Spotify to Computer?